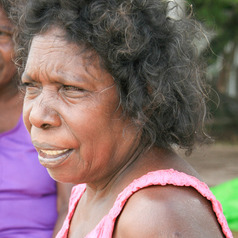 Ritjilili Ganambarr is an Elder for the Datiwuy people and a caretaker for the Gumatj clan. Ritjilili Ganambarr is the co-author of two books, Welcome to My Country and Weaving Lives Together, a book chapter for teachers on sustainability, and an illustrator of Nganapu Nguli Marrtji Diltjiyi (We Go Out to the Bush), a dual-language book written in Yolŋu Matha and English. Her most recent book, Welcome to My Country, co-authored with her sisters, daughter and granddaughter, was published by Allen and Unwin and was awarded an Honour Book for the Eve Pownall Award, the non-fiction section of the Children’s Book Council of Australia. Ritjilili works with her family’s highly successful Yolŋu owned-and-run Indigenous tourism business, Bawaka Cultural Experiences. Ritjilili is a member of an Indigenous-academic collaboration with academics from Macquarie University and the University of Newcastle and is an Honorary Associate of the Department of Environment and Geography at Macquarie University.